Covering more than 94% of paved roads in the United States, asphalt is used all around us. Typically, we use asphalt for industrial business parks and areas of heavy industrial traffic, such as large trucks and fork lift traffic. Fork lifts and large trucks have the entire weight of the vehicle on just a small surface that actually encounters the asphalt, so the project’s sub base and base must be designed and installed at the correct depths without compromising on quality materials, in addition to making certain to achieve maximum density, or compaction. This is to ensure a quality structure without compromising strength. After in-depth testing, a quality base primer in most cases should be applied depending on the base material used. Asphalt is only as strong as its foundation. A strong foundation is essential in anything you build, and asphalt is no different. Asphalt must be designed, manufactured, and installed properly at the corrects depths. In some cases, it is possible for asphalt to achieve maximum density if multiple lifts in the average situation of an asphalt design, such as SP12.5, can be used in one 2” lift. When compacted with heavy vibratory rollers and pneumatic rubber tire rollers, maximum density is achieved in the asphalt, resulting in a strong durable surface without absorbing too much heat in the hot summer days. Asphalt is designed to achieve maximum density, or compaction, at temperatures above 190 degrees. 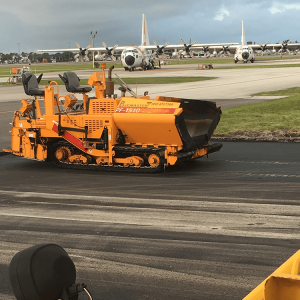 On most summer days in Florida, fresh asphalt can reach temperatures as high as 180 degrees, just a fraction below the temperature threshold. The deeper the asphalt depth, the hotter it may become since fresh asphalt is black, thus naturally absorbs heat. Thicker asphalt also has a tendency to become hotter. This is why, at PaveMaster, we engineer every project to maximize the best possible solution for each client. The other option is 8” of high density concrete, which is approximately double to triple the cost of asphalt. Costs are even higher when repair time arrives, and you can be sure that repairs will be far more expensive with concrete than with asphalt. The size of asphalt repairs is typically smaller than concrete repairs as well. You can also expect the down time to be far less with asphalt repairs, considering these repairs can be completed in less time with immediate opening of the area after repair completion. With concrete repairs, it can take up to three days after repairing an area to open it back up to traffic and 10 days before any vehicles can park there. So not only is asphalt less expensive than concrete, maintenance costs are more economical, saving you money in the long run on repairs, upkeep, and down time. As they say, time is money!